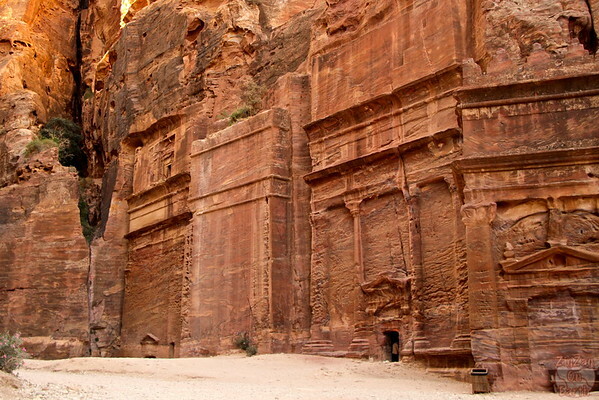 The ancient site of Petra Jordan is an absolute Jewel of architecture and history. I want you to make the best of your time there. 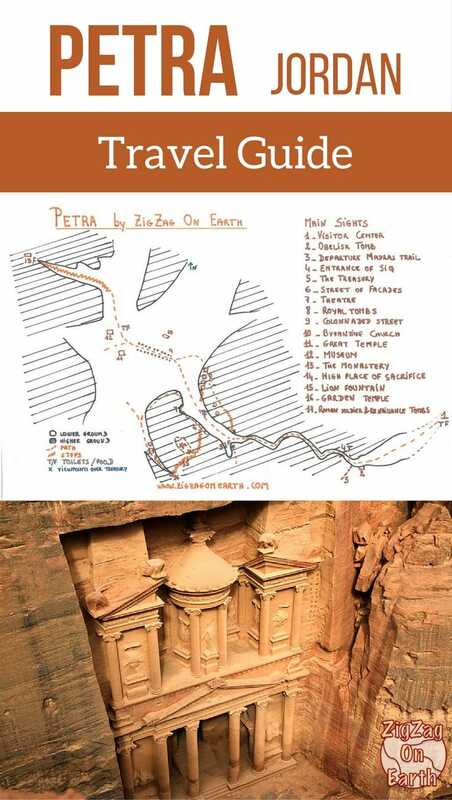 So I have written this guide to help you plan your visit to Petra with: how to get there, how to explore, best Petra monuments, off the beaten path ideas, general tips... and of course a Petra Map to have a better understanding of the Unesco site layout. 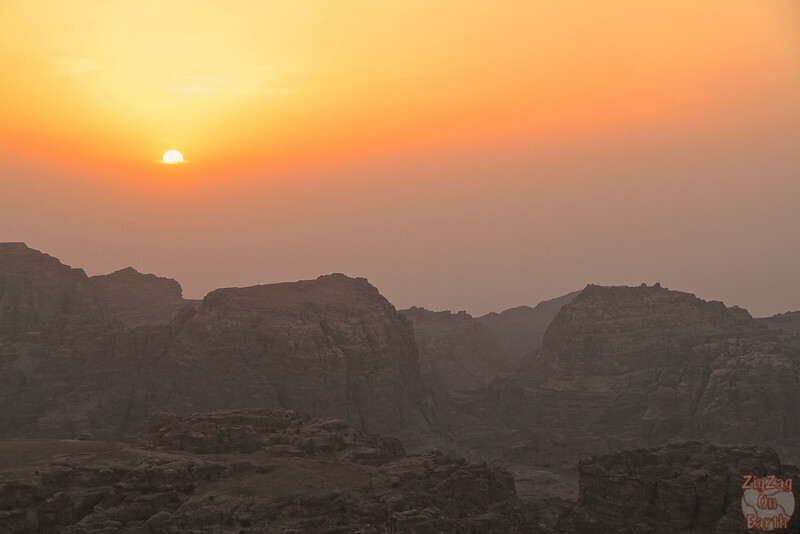 Navigate back to the online ﻿Jordan Travel Guide. A lot of people are wondering how big the site is, if it is easy to find your path, etc. First, the main path is very easy to follow, do not worry about getting lost on it! Second, I have drawn a map of Petra for you. This Petra Map is not perfect with some of the dimensions. And it does not list absolutely every rock to look at (LOL) and I think I am missing a toilet but this gives you a general idea of the layout. Further in the article you can see pictures of the main sites. But if you want to just sit back and relax, there are plenty of tours allowing you to visit Petra from different cities. A great 2 day overview trip with Petra, a night in the desert, the Read sea and a float in the Dead Sea. 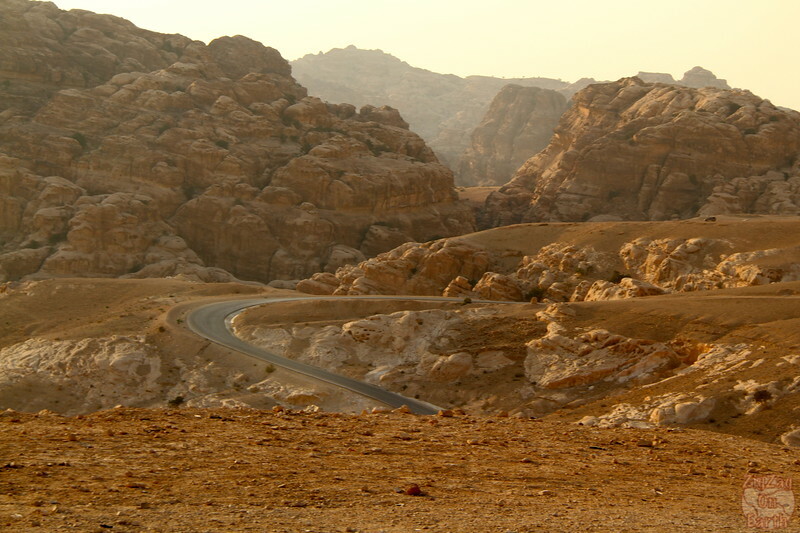 You can do all locations in depth but you will enjoy the many beautiful landscapes of Jordan. Because of the driving time, it is better to plan a multiday trip from Israel. 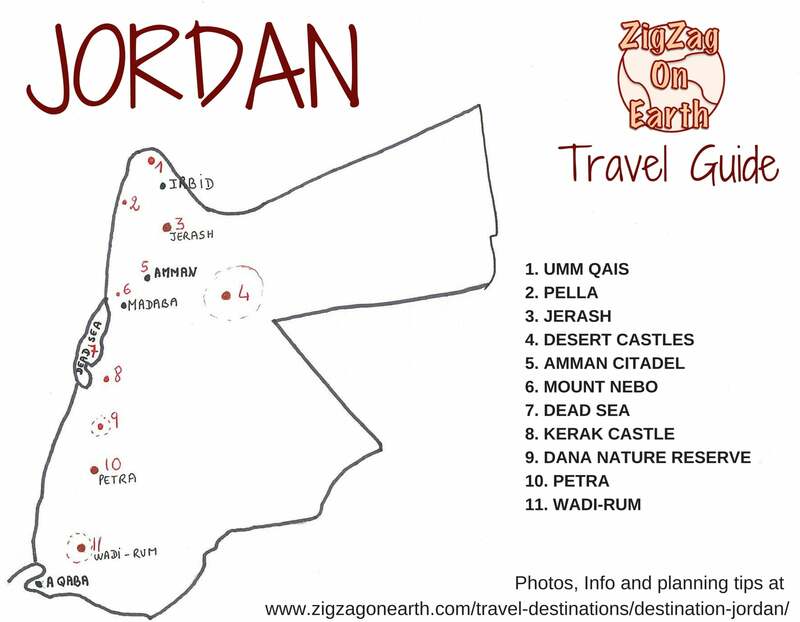 This will cover all the main sites: Petra, Wadi Rum, the Amman Citadel and the amazing roman ruins of Jerash. To avoid the crowds and the heat, I strongly recommend making the effort to be there at 6am. You will get a chance to see the Treasury with almost no one around. 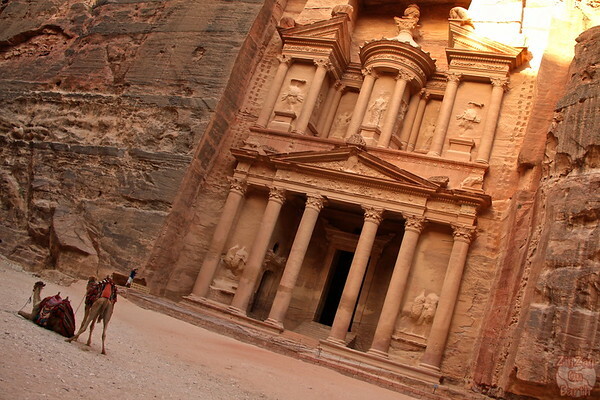 For information on entrance fees, check directly on the official Petra website. I know you want to sleep in during your holidays but make the effort. Having the Siq and the Treasury almost to yourself because you are one of the crazy want who was at the entrance at 6am will increase the feeling of mystery and your experience of it all. And bonus, it will be a lot cooler. Check the live webcam of the Treasury before living for Jordan to have an idea of when the Treasury will be fully lit (in May it was around 10am). There are no really nice sunset spots inside Petra. 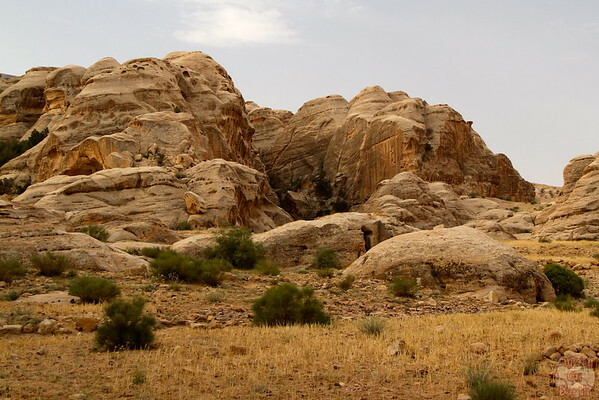 However there is a municipal park outside with nice sunset views over the Petra area. Below is a short description of the things to see a.k.a. 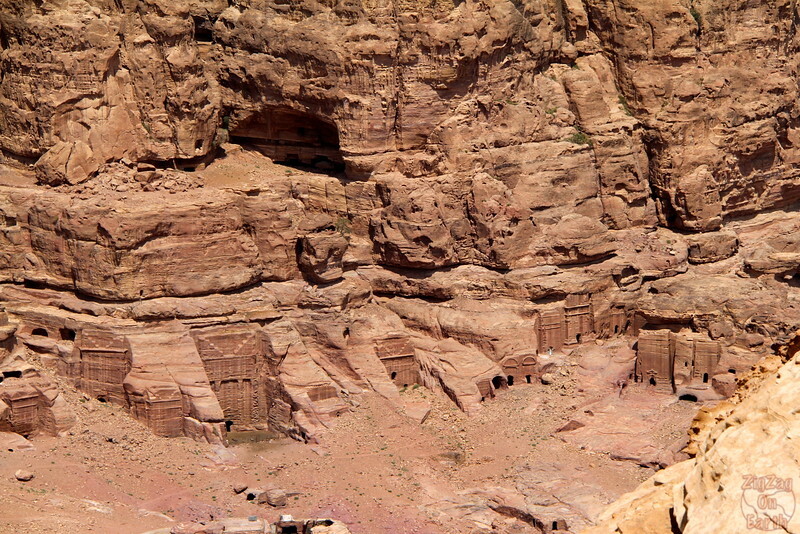 the main monuments to admire once in the Petra site. You can find them on the Petra map above. The Siq is a gorge, a 80 meter split in the rock. 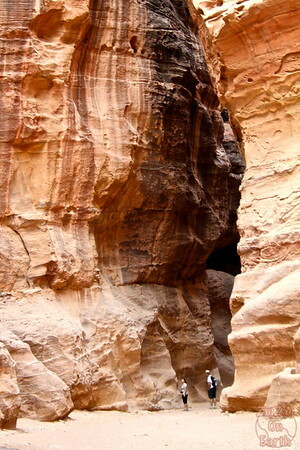 It is the main road to the city of Petra. It ends at the Treasury. It is roughly 1.2km long. Early morning you can be almost alone inside and it is a phenomenal experience! I recommend walking it, but you can also take a horse or a horse carriage. The Monastery, located 850 steps up, is a 48m high and 47m wide facade. Although not as decorated, it is very impressive. See the size of the 2 people at the entrance on the photo!!! See how big it is. If you climb to the high place of sacrifice, don't forget to bring binoculars to see the extent of Petra. Check out my article about the best compact binoculars for travel. 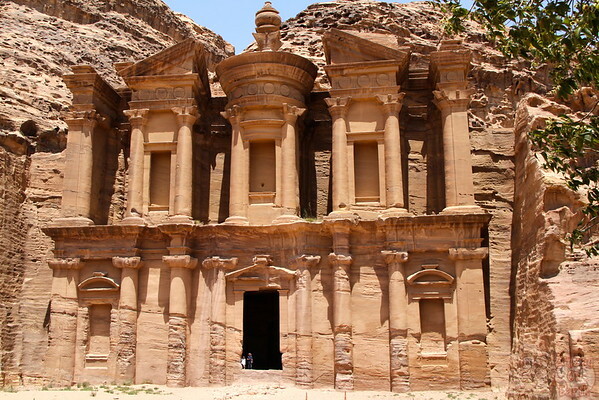 Petra was added to the Unesco list in 1985. Do you collect Unesco sites? Gary from Everything Everywhere is listing all the Unesco World Heritage sites he is visiting. This is quite impressive. Going up to the Monastery: the path start with a little bit of sand and then I counted roughly 850 steps to get to the top (see my post about the climb) and it took me less than a hour (although I am overweight). Attention no toilets up there! 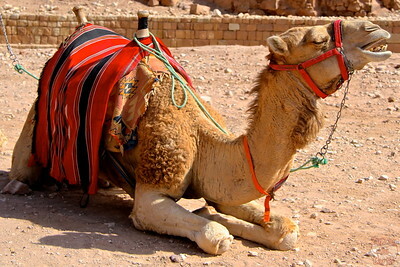 I had read some reviews that only the camels are properly treated. And I saw a kid hitting a donkey with a metallic chain, we stopped him but not for long. I also saw teenagers being brutal with dogs. Twice I had dogs come and sleep next to me very quietly. I had the feeling they knew that next to tourists they were protected. However, I believe some treat their animals very well and there is a place where you can report abuse. So check how the animal is doing before getting on him. 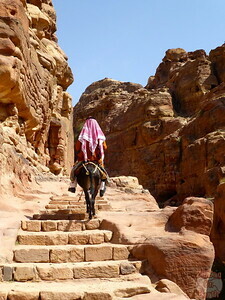 There are plenty of trails to experience Petra off the beaten track. So if you have more than a day, consider hiring a guide to discover some other parts of the area. 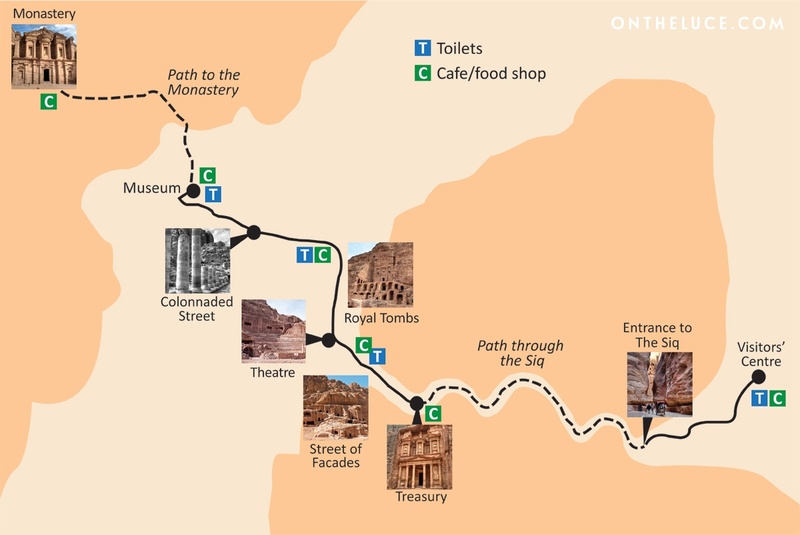 An example is the Madras trail, a not so long trail that brings you to one of the main sight in Petra, the high place of sacrifice. I met a group which did a 9h long hike in the mountains around Petra. They really enjoyed it. So check what is possible with a guide. Rehydration: eat salty chips and drink juice – I read that before going and I must admit I was amazed. This is really efficient. Clothes: Cover your skin and you head. People always think that it will be less hot if they are less covered. But a light cotton is so much more confortable! Avoid the hottest hours of the day – on the first day I stayed in the cave of the bar in front of the monastery during those hours and I really felt better afterwards. For example, I stayed at the Petra Palace Hotel. The location was very practical as I wanted to be one of the first ones to enter the site in the morning. Check ﻿﻿﻿availability ﻿and rates. Pros: Incredible views over the regions, great for sunset - if you are looking for resort style hotels, this is where they are. 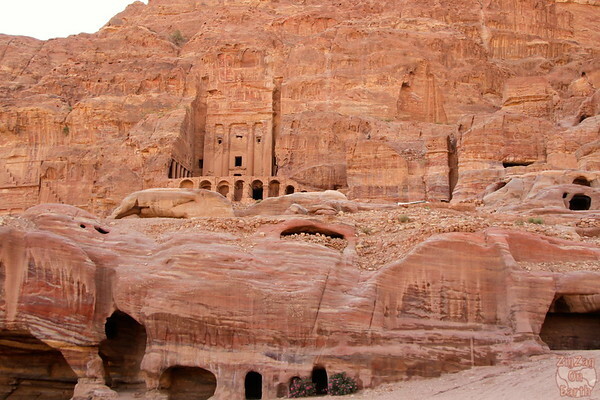 For example, you can stay at the Marriott Petra Hotel with its amazing views (see photos via the link). Check ﻿﻿﻿﻿﻿availability﻿﻿ ﻿and﻿ ﻿rates. Tops with technical fabric that allow breathing considering how much you are going to sweat, or a light shirts or blouse. Good Summer hiking shoes (unless you visit in December to February, then normal hiking shoes. I have had Jack Wolfskin shoes for years, since I've lived in Germany and I love them. You can check out my complete guide to choosing your compact binoculars. Little Petra is a smaller version of Petra, one of its suburbs. Entrance is free and there is one tomb which paintings remaining. 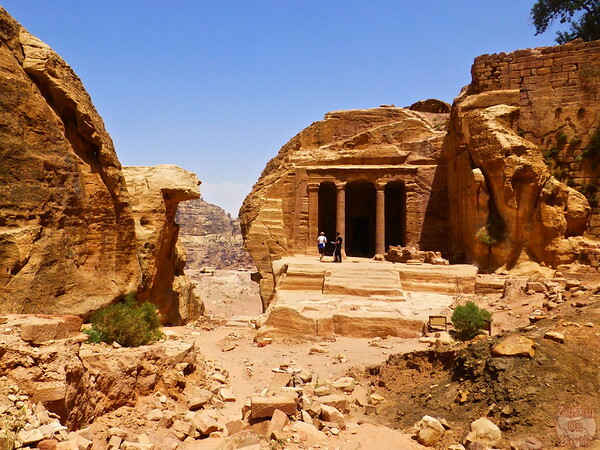 Should you visit Little Petra? You can read very different opinions and reviews about the interest of doing Little Petra. If you have only one day I would not recommend it. 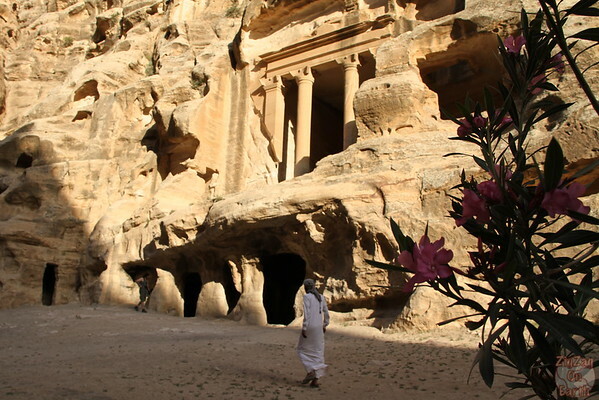 If you have more time, you should consider it check out my Little Petra post to help you decide. 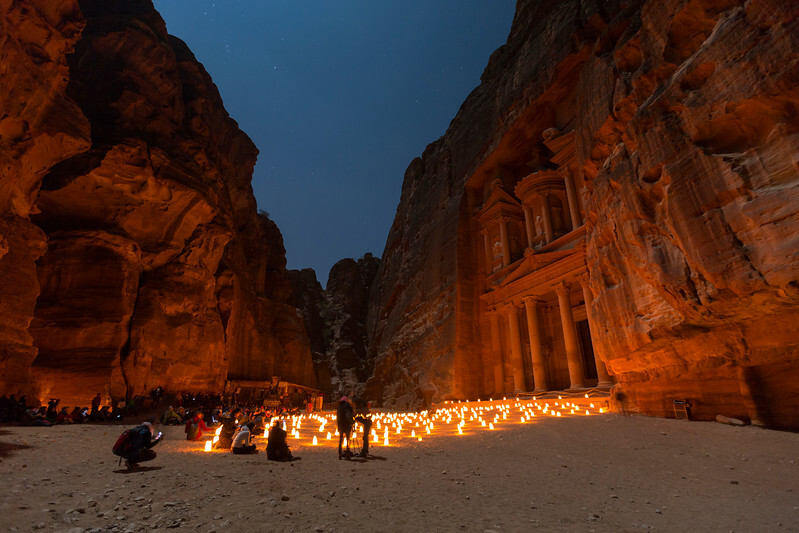 What is Petra by night? Should you do Petra by night? I have not done it. But check out the reviews on tripadvisor, opinions vary greatly. Personally I was too tired and did not want to be in a big crowd. Remember that it means walking the whole Siq both ways once again! The most useful advice I have read though is: when it is finished and everyone is leaving just wait a bit, let the crowd move along and then you will be able to enjoy the walk quietly almost to yourself. Thanks for including my post about Petra here. This is quite a comprehensive resource — great job! Hope you enjoy your time in Jordan! Hi Susan. Thanks! You are the first one the comment on my blog. YEAHHHHH!!! Your post on Petra was the one which really convinced me to get there at opening and it was so worth it. Therefore I wanted other people to get a chance to read it! Comprehensive yet concise, exactly the information I needed for our family trip in October. Thank you for your time and effort for putting all these here. Thank you so much for your comment! I am very happy that you found it useful. Enjoy your trip! Thanks for the lovely postings and the photos along with the useful tips & maps. If I only have 1 day, what would you suggest? I was thinking of doing everything on your map (not hike up The Monastery) but adding a hike up High Place of Sacrifice and return the way I came. I’m going with my parents in October. Thanks you for your comment Christina. I am glad you are enjoying my posts. I would recommend you do the Siq, the Treasury and the lower road. And then you can decide based on your state. With all the info you have now you can decide on the spot. If you choose the high place of sacrifice I would recommend going back down via Wadi Farasa as you will see a lot more than through the stairs. There are plenty of tombs, the scenery is narrower and there are o lot less tourists which I loved. Just also note that there is no café or toilets at the high place of sacrifice but the view is worth the climb, you really get the sense of what Petra was! Thanks. 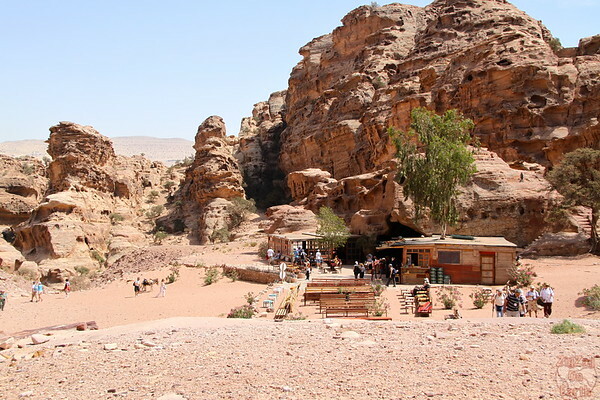 Is it doable to hike down via Wadi Farasa after the High Place of Sacrifice without hiring a guide? You are right, I did this part with a guide. From memory most of it is easy to follow with steps and a path. Maybe once you are at the bottom this is where it is less obvious but you just have to remember the map and go to your right (without starting climbing…) and you will be fine. And at the top, to find the beginning of the path, you can just ask one of the person selling souvenirs. Anyway you will not be alone in the middle of nowhere. People take this path and there are women selling jewelry along the way. Thanks for leaving a comment. Makes me so happy you found it useful. Have a great trip! This is a very useful blog! Thank you. Awesome write up. Going over thanksgiving week. I live in Pakistan, back in 1974 once I was 4 years old I used to live with my family in Jordan. My father was a military doctor in Pakistan Army. He was posted in Jordan on deputation, during summers of 1974 in the month of June I along with my family visited Petra and its surrounding tombs, I still have a glimpse of these in my mind but my father took lots of pictures which reminds me being there. Now in Jan of 2018 I myself being a retired military officer still cherish those childhood memories that I also have visited this great site some 44 years ago. Your article is comprehensive and very detailed. Most beautiful thing is this that my present-day wife was also with me there and at that time she was just 2 years old. You can say we both met each other in Petra for the first time in our lives. We have three children and my eldest daughter in now almost completing her university degree. It’s a great site to visit at least once in a life time. Time passes in a flash. Is there any WC (toilets) at the entrance center or anywhere else? As you can see on the map (letters T). There are toilets near the ticket office, at the entrance of the Siq, on the lower road where shops and restaurants are and at the museum. However none of the higher locations have toilets. I’m 87 years young. Is walking through Petra really do-able? does it make sense to fly from Tel-Aviv to Petra rather than drive. I really can’ tell you. I have seen 87 years young people with extremely different level of ability. It is quite a lot of walking. You could pay for a carriage through the Siq to the Treasury and back to be in better condition to enjoy the main monuments of the lower road. – Drive takes 6h plus time to cross the border.